Wild roof at about 30' leads to fun face climbing. Joins up with the end of Sinbad Herbert A final 5.6 R pitch to the top on Sinbad Herbert is not recommended. 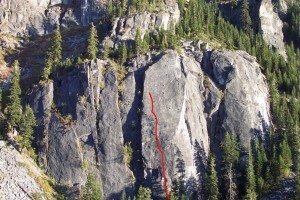 Rappel to descend with two 60m ropes or traverse right to The Groove bolt anchor. Rappel from there with one 60m rope or continue to the top. Which SuperTopo guidebooks include a topo for Crown Royal?